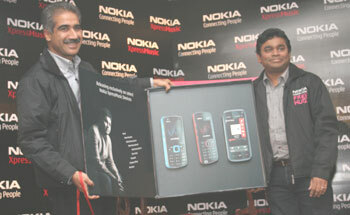 MUMBAI: Breaking new grounds on the mobile music front, Nokia has collaborated with India's leading music composer - A.R. Rahman to launch the first of its kind music album, Nokia Connections, exclusively for its XpressMusic devices. Conceptualized by the legendary A.R. Rahman, the album has nine original compositions from the maestro, along with other eminent musicians such as Sukhwinder, ShivMani and Blaaze. The soul stirring compositions across music genres and languages such as Rajasthani, Punjabi folk, Hindi, Tamil lives true to the Nokia proposition of "Connecting People". The music video of the track has been directed by the award winning Kanika Myer of BharatBala Productions. The track reflects different moods and genres of music bringing and tying them together into a beautiful composition. The music video will be released in association with Universal across all leading music channels in mid-December. Speaking on the occasion, Nokia India head GTM Vineet Taneja said, "Music on the move is, and will continue to be, an important element of the mobile experience. Nokia has blazed a trail for music on mobiles â€“ from handset personalization via ringing tones to music consumption through integrated FM radios and MP3 support. Nokia's music innovation continues as we offer more and more localized and relevant content to our consumers. We share a very special and long-term relationship with Rahman and we have pioneered many innovative things together â€“ the first vertical format video with 'Pray for me brother', the first remix contest for a Rahman song and now this exclusive album for the XpressMusic devices. We thank Rahman for participating in our journey of redefining mobile music."